Is there anything more wonderful than a juicy mango? We think not. But unless you live on a tropical island, mangoes can be hard to come by during most of the year. Lucky for us, Thrive mangoes are as close as your pantry. 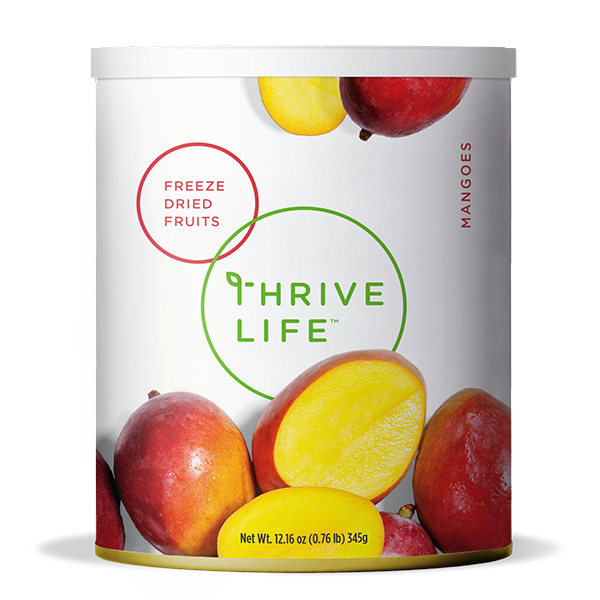 An excellent source of Vitamin A and Vitamin C, Thrive mangoes are conveniently diced into small cubes. That means they're perfect for tossing into a salad, salsa, or parfait. No mess, no clean-up. Meet tropical perfection. Add 1/3 cup water to 1 cup Mangoes; cover and let sit 5-10 minutes or until tender. These small cubes are the ideal size for mango salsa—just mix them in with our Bell Peppers, Onions and Cilantro. They are also a great addition to salads and smoothies.